Rosade is a spacious property set in an 800m2 garden with private swimming pool, parking area, and a traditional andalusian patio with BBQ. There are 6 bedrooms, one of which is on the ground floor, and 4 full bathrooms. It has an ample living room, dining room, and fully equipped kitchen as well as a very comfortable TV room. The house is completely equipped with kitchen utensils, bed and bathroom linens, wi-fi and 12 individual safes. Rosade was designed by José Luis Fernández del Amo, a laureated Spanish architect, in 1969 and was for many years the family country home. In 2005, the house was completely renovated and modernized, but it has not lost its charm. Since then, improvement works and refurbishing have been carried out on a yearly basis to ensure the highest standards of quality. Adela was super helpful, and extremely friendly. The Villa is also really nice, and well kept. I strongly recommend. Thanks Oded for your nice review. You were a wonderful "leader" with very good communication skills. I appreciate very much how enthusiastic you are getting good things in life! Hope you enjoyed barbecue and swimmingpool, tv footbal games, and still doing good job in your "business" in Madrid. All the fellows were so polite and friendly... it was my pleasure to have you at home. Hope to see you again. Birthday weekend in Madrid - Superb! I celebrated my birthday in Madrid with 10 friends and it was a great experience even without the use of the pool. Even in April, it was great weather to read in the garden and hold a BBQ outside. We mainly ate at home and the house had everything we needed in the kitchen, plenty of room in the dining room and TV room, and a supermarket only 2 streets away, so a car wasn't even necessary. The bus is also 2 streets away, so it was great to get to Madrid even to go out at night for dinner or drinks. There are also plenty of activities nearby like going up to El Escorial for a wonderful cup of hot chocolate, or paintballing, shopping, etc. Overall it was a great stay and we would definitely do it again! We booked this villa for one week in October 2011. Overall we were disappointed in the value for money. The house is large, but the furnishings are not of high quality, more worn Ikea. The mattresses are not good quality, and do not provide much support. The pool was not cleaned prior to our arrival and had bird droppings in it. There were also a number of broken tiles on the bottom. The pool is not heated. The outdoor eating area shown in the photographs was quite dirty. Expect to share the garden with up to 5 cats and a chicken. Do not expect to be able to use the dishwasher and a shower at the same time, the cicuit board will trip. Also do not go out and leave the dishwasher on, the power may trip and the electric gates will not open. We had to climb over the wall to get in. I could not find smoke detectors, but the emergency lighting thankfully worked - the power trips a lot. The kitchen does not have an oven or grill. The microwave has the wrong turntable, so does not rotate to give even heating. The area is quiet, and there are some nice restaurants around, but don't expect many people to have much English. Overall we enjoyed our week, but feel the property is overpriced and would not use it again. Wir haben die Zeit im Garten und am Pool genossen. Die Lage ist schön ruhig und trotzdem ist alles gut zu erreichen! Wir kommen wieder!!! 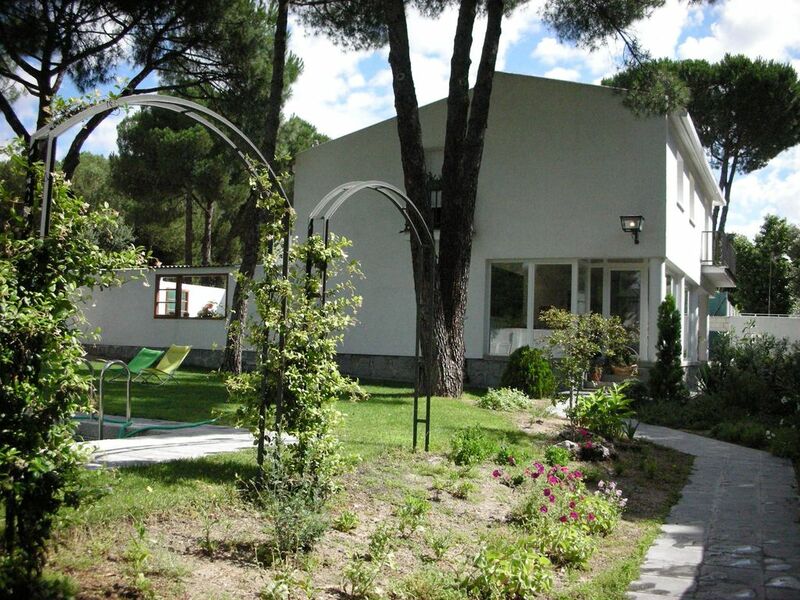 Fantastic villa just outside the center of Madrid (20 min drive). We went there with 15 guys. The owner, Adela, is really helpful and flexibel. I would definitely recommend the villa! Mi familia y yo misma, no pudimos escoger un mejor lugar para volver a reunirnos y pasar un fin de año y Reyes como antes, todos juntos..
Sus propietarias: Adela y Rosa son personas simplemente encantadoras y te facilitan todo lo que necesites. De la casa nos gusto que tiene "alma" y solo lamentamos que el podernos reunirnos toda la familia fuera temporada de invierno pues los meses de verano ,con la piscina incluida en el disfrute, debe ser increible. Solo tengo que decir gracias a Adela y Rosa por permitirnos compartir su casa y recomendar esta propiedad a familias, que como nosotros, quieran disfrutar de poder volver a reunirse.